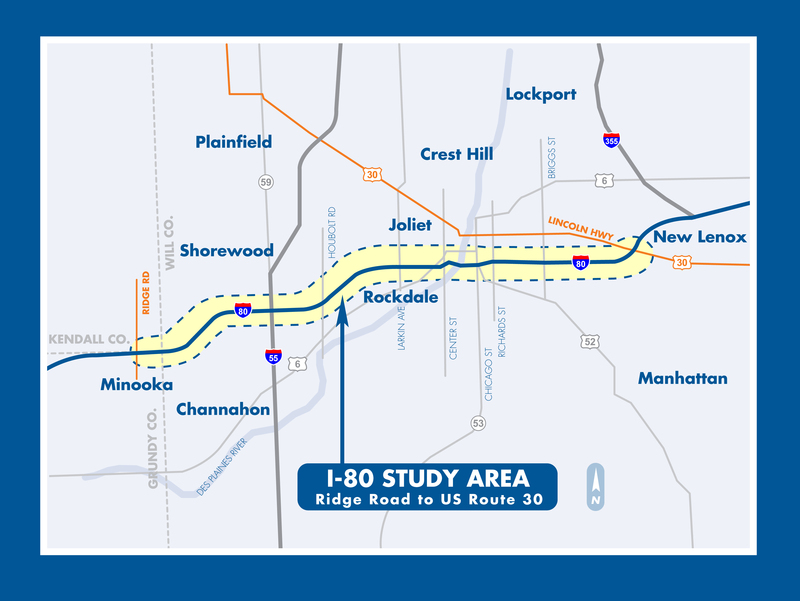 The I-80 study area begins at Ridge Road to the west and ends at U.S. Route 30 to the east, approximately 16 miles. The corridor encompasses three counties (Kendall, Grundy and Will), and passes through six municipalities (Minooka, Channahon, Shorewood, Rockdale, Joliet and New Lenox), and consists of a diverse mixture of land uses including agricultural, residential, commercial and industrial with rural, suburban and urban characteristics. The roadway crosses four waterways (DuPage River, Rock Run Creek, Des Plaines River, and Hickory Creek), includes eight interchanges, and handles heavy truck traffic. The I-80 Phase I Preliminary Engineering and Environmental Studies is taking a detailed look at the current and future transportation needs of the corridor. The study includes an analysis of existing roadway and bridge deficiencies, safety and capacity issues, and future transportation needs, and includes an extensive public involvement process. IDOT will continue to reach out and engage stakeholders throughout the Phase I study process through a variety of opportunities and methods intended to maximize public participation in the identification of project solutions. This improvements which are the subject of this study are not currently funded in IDOT’s Multi-Year Highway Improvement Program and the study is expected to take about one and a half more years to complete. The I-80 Phase I Study took a detailed look at the current and future transportation needs of the corridor. The study includes an analysis of existing roadway and bridge deficiencies, safety and capacity issues, and future transportation needs, and includes an extensive public involvement process. The study is following the National Environmental Policy Act (NEPA) process and will involve the preparation of an Environmental Assessment (EA). NEPA is a federal law that requires federally funded projects to evaluate a range of alternatives - including doing nothing, known as “No Build” - and asses the impacts of those alternatives on the environment. It also requires agencies proposing a project to consider input from the public before making a final recommendation. .
1. Improve regional and local travel and access. Improve regional traffic flow, or levels of service, on I-80. Improve local traffic flow, or levels of service, in ramp merge, diverge and weave sections and at ramp intersections with cross streets. Improve multi-modal connections and opportunities. 2. Improve facility condition and design. Address problems with the outdated design of the roadways, or geometric deficiencies. Address problems with the condition or outdated design of bridges, also called bridge deficiencies. 3. Improve safety for all users. Address the high amount of rear-end and sideswipe crashes due to traffic congestion on the mainline and in merge, diverge and weave areas. The project team has held six project working group (PWG) meetings and three public meetings to gather input on transportation needs and potential solutions in the I-80 project area. 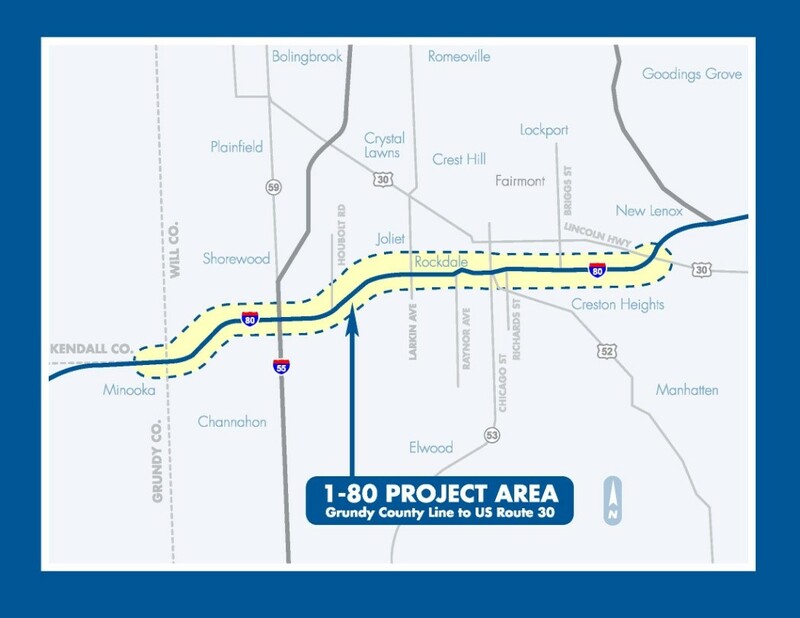 In general, the input focused on reducing congestion on I-80, lengthening ramp entrance and exit areas, repairing existing pavement and bridges, upgrading the I-80 bridge over the Des Plaines River and upgrading existing interchanges. The alternatives within each category listed above are compatible with the alternatives in the other categories. Therefore, alternatives in one category can be combined with alternatives in the other categories to create one, complete improvement alternative for the I-80 project. The preliminary alternatives in each category were presented to the Project Working Group in September 2013. In general, the project stakeholders did not offer specific comments but showed support for any improvements that address local traffic and safety problems, specifically in the interchange areas. At Center Street, many people expressed a desire for a simpler interchange design that also improves the visual appeal as motorists approach downtown Joliet from the west. The bridges over the Joliet Junction Trail were also coordinated with representatives from the Forest Preserve District of Will County, who offered comments about lighting, drainage and general design of trails that will be impacted by the project. Finally, the project team presented to the Illinois River Carriers Association on January 20, 2012. No specific comments about the Des Plaines River Bridge alternatives were offered during the meeting. Preferred alternatives were presented at the PWG meeting (#6) held on December 5, 2017 and then presented to the public at the third Public Meeting on January 31, 2018. These provided opportunities for stakeholders to provide their comments on the alternatives presented. The Alternatives have been presented to the environmental resource agencies through the NEPA 404 merger process and all parties gave their concurrence to the Range of Alternatives to be studied further in February 2017. During the next several months, the study team will continue to meet with the PWG, public, and interested parties to solicit feedback on the preferred alternative. The preferred alternative for each category will be combined to create one, complete recommended preferred alternative which will be presented in 2018/2019.